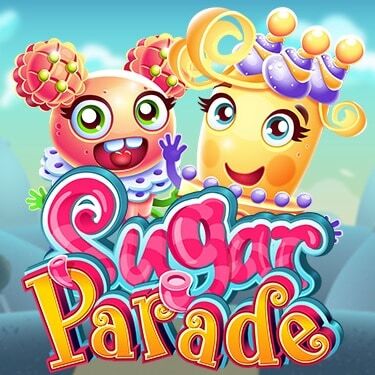 We and Microgaming Casinos bring you a delicious game, Sugar Parade, with a chance to play for some delightful treats. Satisfy your sweet tooth with this amazing slot that has 5×3 reels, multipliers, Free Spins, a bonus feature and an appetising potential 620,000 coins jackpot. The Sugar Parade slot is one of the sweet Microgaming’s releases in their reach gaming portfolio. We are sure that you can’t get better than this slotastic online game. Try it now for free! When you land 3 or more Scatter symbols in the form of delicious ice-creams, you will earn yourself 10 Free Spins, and, all the line and Scatter wins will be multiplied by 3x! These amazing Free Spins can be re-triggered with 3 or more Scatter symbols in any position. All the bets played will be the same as the initial bet that triggered the Free Spins feature. Land 3 to 5 of the Bonus symbols and you will get the chance to play in the Bonus feature. During this feature, you will be awarded with a predetermined amount of picks based on the number of the Bonus symbols that have triggered the Bonus feature. Each pick will award you with a random instant cash prize of up to $/€12,500! Landing 3, 4 or 5 Bonus symbols on a payline will award you with 3, 4 or 5 picks respectively. Play Sugar Parade at any of our Microgaming Casinos and get the sugar rush that could change your fortune forever. Play for an amazing 620,000 coins in the sweetest jackpot!